Ooops! Alarm over ‘sinking Islands’ premature as sea level falls at Kwajalein Atoll | Watts Up With That? Remember this little article by Nils-Axel Mörner, not quite three years ago? Of course, the Climate Community sounded the alarm. “Sinking islands call for NZ action,” trumped the New Zealand Herald. “Low-lying islands face existential threat from rising sea levels,” declared the Bangladesh Daily Star. But Nils warned against drawing panicked conclusions from just one tide gauge. He pointed out that the apparent surge in sea-level at Kwajalein was atypical, and thus unlikely to herald an acceleration in global sea-level rise. He speculated that it could be due to local factors, such as subsidence caused by local construction projects. 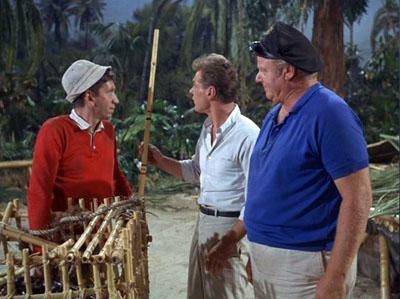 “In conclusion, don’t “hang your hat” on the Kwajalein graph,” he wrote. Willis Eschenbach then chimed in, and pointed out that the the apparent trend was simply too short to draw any conclusion from it. Indeed, the literature indicates that at least 50-60 years of data are necessary to deduce a robust sea-level trend from a single tide gauge record. It’s obvious that the apparent acceleration in sea-level at Kwajalein was transient, and did not indicate the beginning of an accelerating trend in sea-level rise. To me, it looks like sea-level at Kwajalein is inversely correlated with ENSO. When the current El Niño ends, so will the current dip in sea-level at Kwajalein, probably. Over the long term, the sea-level trend at Kwajalein will prove to be approximately linear, just like it is at every other high-quality, long term coastal tide gauge in the world. Seven decades of heavy GHG emissions have caused no increase at all in the rate of coastal sea-level rise. 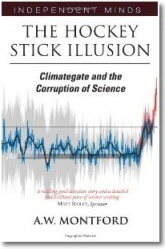 ← Peter Gleick Resigns as President of Pacific Institute … Because of Fakegate? We’re in real trouble when sea level starts falling. Please, Gaia, let it continue to rise. It won’t fall until we’re past the tipping point to glaciation. The Ice Age is comin’! Gaia is a lie. Screw Gaia and anyone following that New Age bilgewater. If this continues, we will have children who do not know what oceans and seas and fish are. It Truly Is Worse Than I thought. It’s always humorous how the alarmists have a CO2 answer for everything. Then when they are proven wrong…. crickets. CO2 has falsely been made liable for all climatic and biological harms. It is an amazing inversion of the truth, for CO2 works in many mysterious ways its wonders to perform. 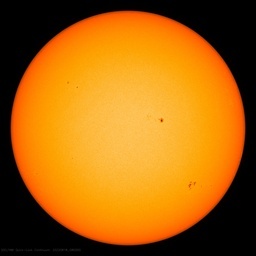 Warming is always net beneficial, and the greening, were it not so predictable, is miraculous. Yes, everything is an imminent disaster, but it is never hailed as good news when the would be disasters do not happen. They took the first sea level reading when a whale farted as it was passing by, thus, the humongous bubbles caused a false reading !!!! Like with land data, they want average data for sea levels, average doesn’t tell you where levels are rising and falling, so falling levels never get mentioned, only the increased average, which is pretty useless as a metric for anything relating to studying causes, useless. Average temperature is the same, it tells you nothing. The entire North Cape is rising due to isostatic rebound from the Last Glacial Maximum, hence those Viking-era ports that are now 100 yards inland, while Britain is subsiding, hence the sunken parts of the Scilly Isles and all those flooded estuaries. yikes! Looking at the falling trend since 2010, it is clear that the oceans are quickly disappearing due to global warming. At this rate, in 100 years of less earth’s oceans will all be gone. All that hidden heat’s causing them to evaporate! Kevin Trenberth will be pleased. Yeah, oceans are evaporating from global warming. All that water is boiling off into space. From a distant viewpoint Earth must appear to be a comet. Cool! Corals can cope with rising sea level far more easily than with falling. Corals in waters with upwelling cooler water do not fare well in El Nino warmer waters. Onset of a quick large increase or sustained increase tends to kill off corals when their cousins in stable temp waters can take another 2c and still survive. As for the GBR, Queensland farming of cane has increased 150% and plenty of nitrogen ends up in the reef, among other chemicals probably. Excess nitrogen bursts causes corals to bleach themselves by expelling them zooxanthellae which are sustained by the Coral’s metabolism waste, so controlling the number of zooxanthellae. Excess nitrogen from the water causes the zooxanthellae to reproduce faster than needed which probably the coral deals with by bleaching, expelling zooxanthellae or if possible digesting them. I am reminded of the old Saturday Night Live “Emily Littella” routine-“nevermind”. Climate alarmism, you stupid cant. I originally thought of it with an apostrophe, but this is better. Can someone tell Dame Slingo of the Met Office that her climate change stuff about accelerating SL rise is a lie . Who will bell the cat, since we can’t count on its drowning? Why is there a negative correlation of sea level with ENSO for Pacific islands? I’d like to know too. In fact, why is ENSO correlated in any way? I don’t know the mechanism here. I’m very sketchy on this but crudely was under the impression that the Easterly blowing trade winds pile water up in the oceanic west during El Nino and then eventually slosh back west towards South America in La Nina conditions. Marshall Islands being in the west of the Pacific I thought might have a +ve correlation with ENSO if anything. We wait on someone who knows … tia. cephus: You’ve got the principle, but the specifics are backwards. During neutral and La Nina conditions, the prevailing winds push water to the western tropical Pacific. During El Nino conditions, this breaks down, and you get warmer and higher water in the eastern Pacific. The El Nino caused the sea level rise to accelerate in So Cal in 2014 and 2015. It reached the highest level in the 90+ year record in 2015. I’m surprised the alarmists haven’t made a big stink over it. I anticipate the level will fall in 2016 and 2017. Zoom the map out to see the trends for the world, and it will become obvious that on a regional scale vertical movements of tectonic plates is the overwhelming trend-setting factor. Compare the trends in northern Europe with those in Scandanavia. GPS Stations at Kwajalein and nearby Majuro Island (also part of the Marshall Islands) indicate there is no vertical change compared to the GPS satellites between the two islands (might need to have a longer signal to be able to say because Kwajalein did drop right at the end of its record in 2003 but it is probably an artifact). I’ll worry about seal level rise when tide gauge readers have to use scuba gear. Even then I won’t worry much; I’m at approximately 1,700 feet above sea level. I say approximately because the elevation may have changed while I wrote this. Nature’s pace is often eons – adjusters equipped with computers are much, much faster. Make that sea level rise. Seals aren’t a problem for me because I don’t own a polar bear. when I read it, I saw it as sea. I didn’t even notice it read seal until you pointed it out. The ocean once again eats the Clima-toilet-gists homework. Interesting, Willis. 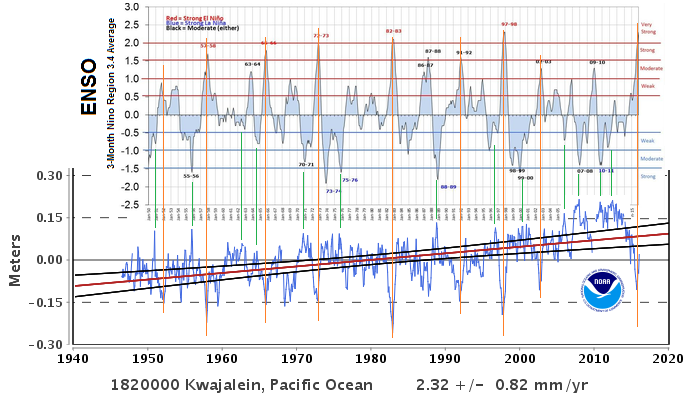 Looking at your Seaframe chart I notice its very strong response to the super El Nino of 1998 which present sea level change seems to try to emulate. 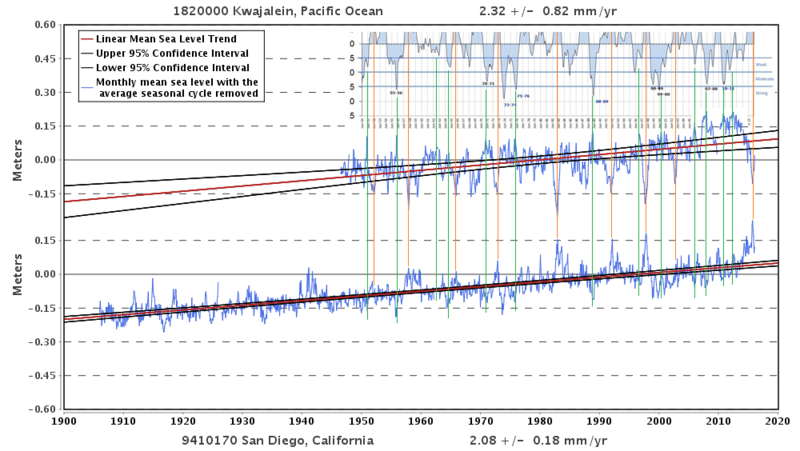 I still go with Chao, Yu and Li who found in 2008 that global sea level rise had been linear for the previous 80 years. Something that has been linear that long is not about to change anytime soon. The slope of their linear section was 2.46 millimeters per year. This works out to just under ten inches per century. Al Gore at the same time was touting a sea rise of twenty feet per century that, according to him, would put Florida under water. And got a Nobel Prize for that trash.You would think that science journals like Nature and Science ought to be interested in this, but you would be wrong. When I attempted to tell them about it both sent my article back, no explanation, no peer review, no nothing because the science was settled, you see. It was, let’s not forget, a Nobel PEACE Prize that had nothing to do with any form of science at all. A propaganda tool designed to reward those who are doing something fashionable at the moment. It was very amusing to watch a number of very insecure scientific types glom onto it by pretending they had also been awarded that very same Nobel Peace Prize. All they mentioned was the Nobel bit until somebody yanked their choke chain and made them stop lying. IIRC President Obama got one for offering global Hope and Change. The whole of Europe got one for being friendly to its inhabitants so I guess as a European I also have a Nobel Prize. Low-lying oceanic islands are there for a reason – It should be clear to anyone who thinks about it for a moment that it isn’t just an extraordinary co-incidence! They are, in fact, the PRODUCT of rising sea levels rather than the contrary. Charles Darwin wrote a near definitive account of this as a result of his observations on a single voyage 180 years ago, and yet the alarmist claim gets a free ride amongst the great and the good even today.. Almost thought the Beeb were going to make it all the way through to the end there with honest reporting. Nearly made it … but then the inevitable ‘don’t think for a second that means there isn’t catastrophic sea level rise though’. They really cannot help themselves. They are immune to actual knowledge of physical geography or Earth history. Trade winds (or weakness thereof), and westerly wind pulses, are responsible for NINO4 region sea level change over the last 24 years. Majuro tide gauge is showing a similar drop off for the last two years as well as the drop in 1998 but oddly not the drop in ~2002 ? There’s been lots of chatter about the Virginia Key gauge near Miami showing much higher than expected recently…similar explanation there? Opposite phase? Other explanation? Opposite effect in the Eastern Pacific – sea levels along the Western seaboard of the US have been almost static for a decade, but now have started to rise. That rise looks more than just the current El Niño effect. Sea levels along the Southern half of the Eastern seaboard have also shown a recent upward tick, while those further North show a corresponding drop. So we should be expecting a press release from the world media indicating that we dodged a bullet and things are okay. Right? ‘Who will bell the cat?’ asks kim non-pareil. Mörner previously claimed that the upward trend was due to subsidence following building work. What does he pin the recent drop on? The sale of helium-filled balloons to kids? Just trolling, are we Tony? As you can see from Willis’ quote of Mörner (“it looks like Kwajalein is affected by… or some…’correction;”), it is clear that Mörner was just speculating about possible causes. He did not “claim” to know that subsidence was the cause. Nor is it clear that Mörner’s speculation was wrong. Although ENSO obviously affects sea-level at Kwajalein, that’s not necessarily the only thing affecting it. It is certainly possible that subsidence due to construction has also affected the tide gauge  href=”https://www.google.com/maps/place/Kwajalein+Atoll/@8.7320425,167.7345401,504m/data=!3m1!1e3!4m2!3m1!1s0x65ac2eae99e3be7f:0xd63f6a78cbe5df1b”>2] [a href=”http://tidesandcurrents.noaa.gov/images/stationphotos/1820000B.jpg”>3]  . Oops, it wasn’t the Google Maps link, it was my typos. 4th time’s the charm? 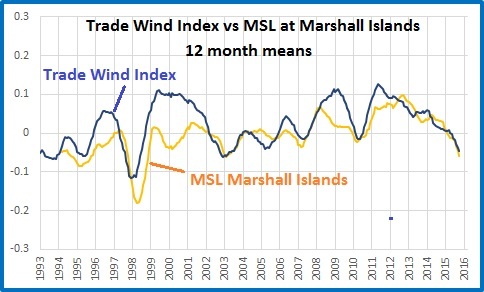 As a marine meteorologist I know trade winds constantly acting on the sea surface have an effect. 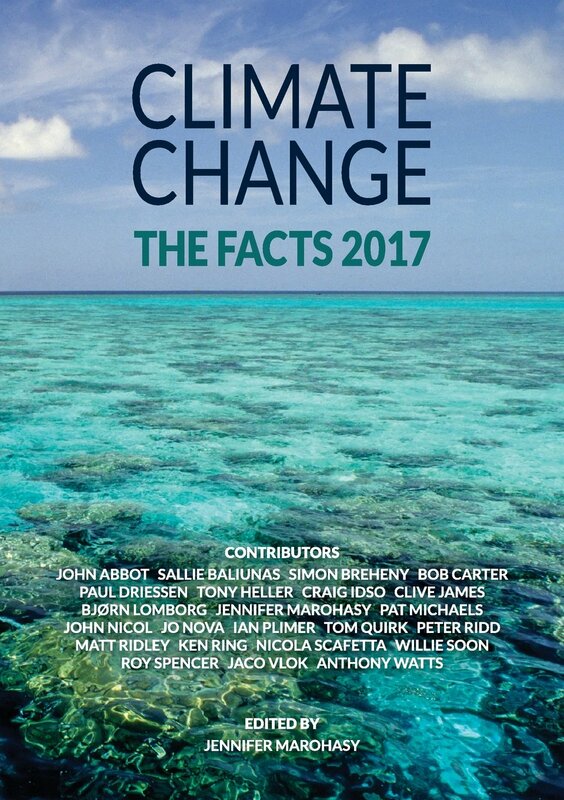 Mean sea levels in north Queensland along the east coast of Australia are around 30cm higher than mean sea levels south of Sydney as the trade winds pile the water up against the coast in the north. This gives rise to the East Coast Current that flows up to 4 knots south along the coastline as the levels attempt equalisation. Trade winds are probably the cause of variations in sea level at Kwajalein. The inverse correlation between ENSO and Kwajalein sea-level means worriers can always find something to worry about: During El Niño they can fret about record-breaking temperatures. During La Niña they can fret about the looming “climate refugee” crisis, from disappearing Pacific islands. I’ll bet there’s a nice correlation between ENSO and the ratio of news stories & press releases about temperature vs. news stories & press releases about inundated islands. ” WHEN NEW THEORIES ARE AVAILABLE, OLD THEORY MUST DUMP. CLIMATE CHANGE THIRD GROUP. AIR CONDITIONING OF MOTHER EARTH. !!!!! Climate Research Fools went to Eastern Antarctic while temperature was -9° C.